At the end of yesterday’s post I told you that the one thing I would have changed about my early Thanksgiving dinner would be to calm down a little bit towards the end and get better pictures of each food item. This dish especially deserves a better picture, but we were all into our first bites when I realized that I hadn’t taken pictures of it. After hearing a round of compliments from everyone at the table, I knew I needed to get at least one picture so I could share it here before Thanksgiving. Hopefully somewhere down the line I’ll get a new (better) picture to really do this side dish justice, but for now this’ll do (and it’s a good thing I snapped it when I did because after everyone’s second helping there wasn’t much left!). 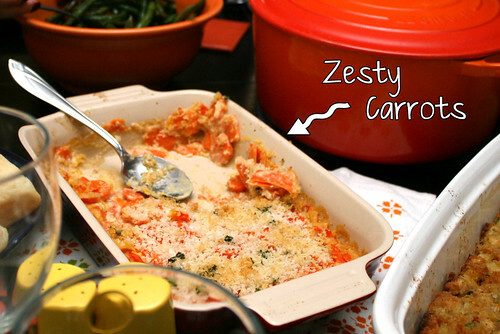 Zesty carrots are an absolute requirement at my Thanksgiving meals. The recipe goes back to my mom’s mom, but it’s appearance every Thanksgiving goes beyond nostalgia. It tastes unlike anything else at the Thanksgiving table. I will admit that it took me several years to finally put it on my plate and give it a try, but once I did there was no turning back. It’s possibly one of my favorite sides each year. This year I included it in my menu plan, not knowing how it would be received. Everyone loved them. Between mouthfuls I heard lots of “Mmm, these carrots are really good,” and two of my guests commented that they don’t usually like carrot dishes but loved this zesty take. Don’t let the ingredients throw you off. I realize that seeing “miracle whip” among the ingredients for a carrot dish is weird, but there’s a balance of flavors here. A little spice from the horseradish, a little sweet from the carrots, a little zest from the miracle whip. There’s also a good balance of texture; creamy from the sauce and crunch from crumb topping. You may be tempted to skip right over this odd pairing of ingredients, but I dare you to just give it a try. *I use the mandolin blade for my food processor to cut the carrots. Place the sliced carrots in a cooking pot (with a lid) and cover with about 1 inch of water with a pinch of salt. Bring to a boil then cover and cook until tender, about 5 minutes. Drain but reserve 1/4 cup of the cooking liquid. Move the carrots to a 2 quart baking dish. In a small bowl or measuring cup, combine the reserved cooking liquid with the rest of the sauce ingredients. Pour the sauce over the carrots and use a spoon to evenly coat the carrots (use just enough sauce to cover the carrots, there may be an extra tablespoon or 2 of sauce if your carrots are smaller). In a small bowl, toss the melted butter with the Panko bread crumbs, parsley and salt. Sprinkle the crumb topping over the carrots. Bake for 20 minutes or until the crumbs start to turn golden brown and the sauce is bubbly. >I bet it would be hard to take all those photos with as much effort as they deserve for that perfect shot! I love baked carrots…and mayonnaise/Miracle Whip. I can definitely see how that works!